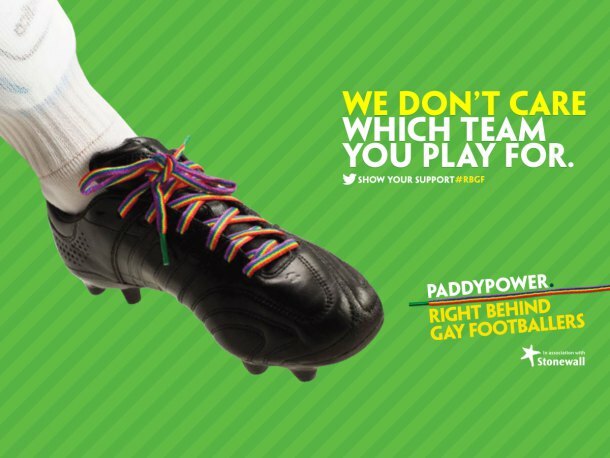 Paddy Power and Stonewall (the lesbian, gay and bisexual charity) have created rainbow-coloured laces and distributed them to every footballer across all 134 professional clubs in the UK. On September 21 and 22, it’s hoped that as many footballers as possible wear these laces in their league games to show support for gay footballers. So, how many gay footballers are there in the UK? Well, out of the 5,000 professional footballers apparently there are none, and that’s got people concerned by the look of it. Will you be showing support for this campaign by wearing rainbow laces to 5-a-side? You might ask why everyone is being asked to support gay footballers if there aren’t any. Well, Stonewall want us to get the message out there that it’s ok to be gay and play football – and they want us all to do it by wearing rainbow colour laces! There might be no openly gay professional footballers in the UK, but to have none at all wouldn’t be representative of society at large. If footballers were a representative cross section of society then there should be quite a few of them who are gay. Whilst it’s safe to say that Stonewall would be delighted if a few footballers come out as gay over the next few weeks, buoyed on by the campaign this weekend, our thoughts are that people’s sexuality is their own concern and if they don’t want to come-out publicly then they shouldn’t feel pressured by this. What’s the big deal over gay footballers? That’s a good question – there really might not be a big deal about it, other than that there haven’t been many coming out and declaring it publicly so far (although as we’ve already said, why should they feel the need to?). In the UK, Justin Fashanu was the first footballer to come out in 1990, which of course caused quite a stir at the time. Justin committed suicide in 1997 with a number of issues appearing to be weighing on him at the time, which is an obvious tragedy, and unfortunately took away some of the diversity in the game at the time (not only was he gay, but he was also a pioneering black footballer – and the first black footballer to command over a £1m transfer fee). After Fashanu, there is a long pause until anyone else came out, but in 2013 up stepped Robbie Rogers, relatively unknown in the UK, having only made 4 appearances for Leeds before being loaned out to Stevenage where he made a further 6 appearances before he was then released by Leeds in January 2013. In February of this year Robbie Rogers came out as gay, and at the same time announced his retirement from football. The reaction of most people seems to be along the lines of “yeah, ok, do what you want”, with relatively little fuss being made, except for those who have hailed him for his bravery in coming out – making him somewhat of a hero in the gay community. Bizarrely, Rogers returned to football in May 2013, signing on with LA Galaxy in his native USA. So things don’t seem to be going too badly for Robbie Rogers and (encouragingly) it’s difficult to find any criticism of him on the internet. In fact, you could say he’s doing really rather better now he’s come out than when he was just ‘Robbie Rogers’ of Stevenage FC. He’s playing for perhaps the most high-profile club in the US, has his own swanky website and has taken on somewhat celebrity status, appearing both on the cover and in the pages of magazines, not to mention receiving fantastic support on his MLS debut. So, maybe things have changed and we’re in a place where it’s not quite the issue that we think it is. On the other hand, goalkeeping legend Oliver Kahn recently advised players not to come out as the footballing world isn’t ready for it, so who knows!? To us it doesn’t seem a big deal whether someone is gay or not – just get on with the football. However, if wearing rainbow coloured laces helps any individuals who may be gay to feel a little more accepted, then let’s give it a go. Joey Barton is doing it – but don’t let that put you off. Where to get your rainbow laces? Paddy Power have a limited number of these laces in each of their stores, and best of all they’re free – so go in and ask for some before they’re all gone. Update 2014: these have now well-and-truly gone so now you’ll have to buy them yourself. Big Laces – from about £2.00 (looks to be very similar to the ones being worn this weekend). 2014 Update: we spoke to Big Laces and since the campaign they have sold a lot of these “We’ve been selling lots of Rainbow laces since the campaign started to all sorts of different organisations and Student Unions in particular have been ordering large quantities“. 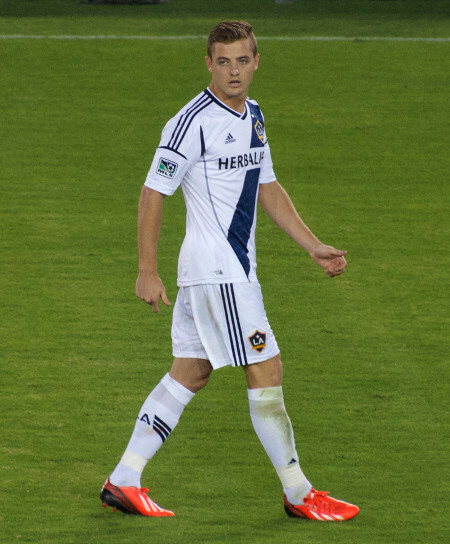 Photograph of Robbie Rogers courtesy of Wikipedia, under creative commons. This is more than about football players coming out. There are a lot of homophobic chants that you can hear at every stadium across the uk. It’s about raising awareness for that too.